One of the best, most useful and well managed discussion boards related to the 40K hobby. This board, originally created by Bloodsaint is specifically focussed on all power armoured armies including spacemarines, chaos legions, inquisitorial forces and the sisters of battle. Extremely active considering that answers to most psot can be obtained within 12 hours, this board retains an unusually large number of moderators for each sub section. All common space marine legions have their own subsections led by moderators who are passionate about their work. It is also visited at regular intervals by GW's games designers and WD editors. The fact that many moderators have been involved in rules revisions, WD articles and also maintain their own websites supporting their specific armies says much for the quality of this site. Parents would be happy to know that a stringent policy on behaviour is upheld on the board in relation to writing style, swearing and off-topic discussions. Abide by the rules and help is abundant. Finally, of course I am somewhat biased, considering that I, along with some members of the Inner Circle are moderators of the Dark Angels forum. Unofficially considered to be the B+C's siister site, the Eternity Gate has many similarities. Based on the same board software and maintained by like minded individuals, this site fills the void left by the B+C. It caters for all armies of the imperium apart from space marines. All loyalist, traitor and xenos armies have separate sections along with sections on painting and modelling. In rcent times additional forums for spacemarines, chaos marines, warhammer fantasy battle and the Dawn of War computer game have been added diluting its somewhat unique stature. An important section is the one for specialist games which concentrates on GW's subsidiary Fanatic. This allows players to discuss the less known ame systems such as EPIC Armageddon, Battle Fleet Gothic and Inquisitor. 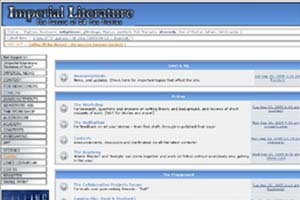 This site started off in 1999 as an attempt to gather the vast quantity of GW related fan fiction in one site. Having suffered a few bouts of teething problem it has now returned reinvigorated in its fourth version. This is simply the largest collection of fan fiction relating the GW's games. The articles are separatee out in to relevant subsection ranging from individual space marine chapeters to specific races like the Tua and Eldar. The quality of the fiction avries but generally keep to a good standard. The stories are maintained in a database which allows the reader to search according to categories, author and popularity. Finally the links section is also extensive and can be searched by poularity or categories. 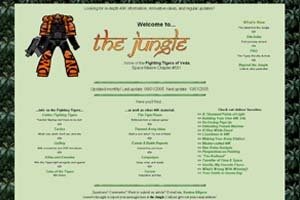 Few in the hobby who venture in to the realms of the internet would not have heard of the famous "Jungle". The base of the fames "Fighting Tigers of Veda" spacemarine chapter, the jungle is far more than a simple show case of a home made army. The webmaster is one of the most prolific writers on the 40K scene. In addition to a continuous stream of news items and eitorials, Kenton seems to have the ability to gather a massive amount of useful articles on gaming and the hobby in general from a large community of gamers. The site itself contains subsections dedicated to the Tigers of veda chapter which includes its own codex, a vast tactics section, a full gallery, a section on armies that have faced the tigers and another on fiction. In additon there are campaign articles, scenary tips, and a number of recurrent themed articles. The latter includes themed armies section dedicated to themeing your 40K army and the "Thousand points of Light" section which is certainly worth its weight in gold. Add to these the regularity of updates and you get one of the best web site / Web Zines out there. 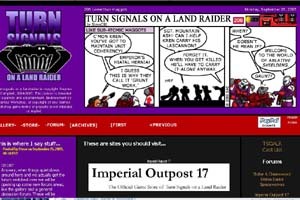 The best web based 40K related comic strip out on the world wide web. The site basically revolves around a weekly cartoon strip that follows the battlefield depradations of a unique and quaint space marine chapter. Enter the "Emperor's Pointy Sticks"! Taking the mickey out of all things 40K from gaming quirks, rules abuses, the weird and wonderful range of gamers and the occasional foray in to other WH games, this cartoon has remained the hallmark of 40K wit. An essential read for all gamers, especially when you get too serious about your hobby that involves grown ups moving toy soldiers around a model battlefield. If you ever get in to heated arguments with your opponent, are unhappy with the way the game went oryour losses at the grand tournament, just come back to TSOLR and your heart will lift.